Welcome To ColleenRichman.com: The Ultimate Skin Elixir! If you've been reading my blog for some time, you'll probably remember a company called Annmarie Gianni Skin Care. They contacted me recently regarding a new product that they were launching and asked me if I was interested in trying it out. Of course I said yes! So, now that I tried it out I want to share my thoughts on it with you. 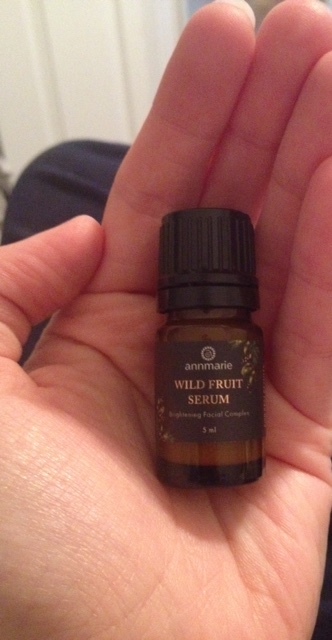 It's the Wild Fruit Serum! I received a travel/sample size and I was impressed with the packaging. It's cute yet conveniently packaged! It went on smooth, no strong lingering oder and it was gentle on my skin. After using it several times, my skin felt more rejuvenated and supple. It's organically grown so there are no harsh chemicals that you need to worry about putting on your skin. After all, what we put on our skin gets soaked up into our pores. It's all fruit, herb & plant-cell extracts! Be sure to head on over to the website and click the "please notify me" button so that you can be the first to get this great product when it comes out! The ultimate skin elixir -- this serum brightens, hydrates, and helps tone aging skin. Brightens skin tone with a concentrated dose of fruit, herb and plant-cell extracts. A dynamic blend of Kakadu plum and apple helps revive dull skin. Resveratrol-rich knotweed, plant-cell extracts and copper combine to help keep skin moist, plump and supple for an overall even-toned, luminous glow.